Get kids revved up and ready to read. Cars, Trains, Ships & Planes is a visual encyclopedia of every vehicle to zoom, sail, soar, float, or fly across the land, sea, and sky. Displaying more than 1,000 vehicles including classic cars, hybrids, race cars, sail boats, luxury cruise ships, BMX and dirt bikes, military tanks, steam locomotives, mountain trains, hot air balloons, fighter jets, International Space Station manned spacecraft and more, plus a glossary and index, this visual catalog is perfect for young transportation buffs. 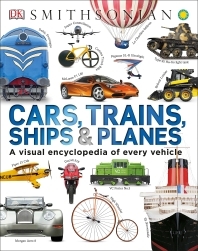 In addition to the eye-catching images for readers to spot and explore, exciting text covers facts and figures on record breakers and news makers and includes the story of the history of transportation - from the first wheel to the latest hybrids - giving this book a special appeal to reluctant readers. Cars, Trains, Ships & Planes is the fastest route to take young readers on a journey to learn about all things that go.